I’ve never been much into beauty products. I don’t wear makeup most of the time, don’t dye my hair, etc. 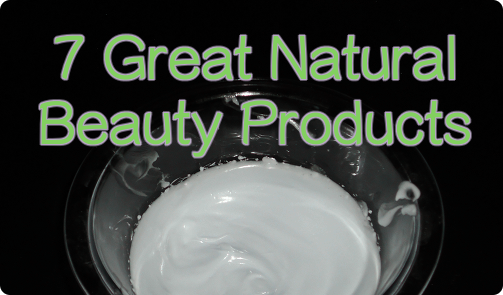 Still, there are some natural products that I enjoy using on my skin and hair that do a wonderful job. Coconut oil is great for the skin and hair. I get the cold pressed stuff, which is supposed to be better. It’s a nice moisturizer for the skin, just rub it on. Be careful about using it on your face, as it can be comedogenic, but I like using it on my arms and legs. For hair, rub the coconut oil between your hands to melt it, then apply to the length of your hair. Leave in for an hour or so, then wash out. Wonderful, soft hair! Yes, this notorious oil has its uses. I mix it with some olive oil to use as a facial cleanser – about a third castor oil to two third olive oil for my skin, but experiment to figure out your own best mix. Too much castor oil can be drying on your skin. Try oils other than olive oil too – it can be comedogenic, but not everyone has that problem with it. Apply the mix with your fingers, then hold a hot, damp washcloth to your face, then wipe the oils off. When I want a lighter oil on my skin or hair, jojoba is wonderful. It feels much lighter than coconut oil, but is still a great moisturizer. It works well in the oil cleansing method with castor oil too. I hardly ever use traditional shampoo or conditioner these days. I mix some baking soda in a lot of water in a squeeze bottle to wash my hair, and condition with watered down vinegar. Then I condition using watered down vinegar, about two parts water to one of vinegar, although I never measure it out. If the smell of the vinegar bothers you, just add some hair-friendly essential oils. You will get used to it if you don’t, and the smell doesn’t stick around after rinsing, but if you find it too unpleasant without essential oils, or you just like the smell, go for it. When you want to indulge while exfoliating your skin, a homemade sugar scrub is the way to go. Pick your sugar – some use brown, some use white, and mix with a skin friendly oil. Massage into your skin, leave it on for a few minutes, then rinse off. Have some fun with your ingredients too. Vitamin E can be a good addition, as can certain herbs or essential oils. We grow aloe vera in our garden and really need to use it more! You scrape out the gel from inside the leaves and apply it to the skin. It feels amazing on sunburn (or burns in general) and is a good moisturizer. Some people drink aloe vera juice , but I haven’t tried that. Homemade bath bombs are easy to make and feel great. The basic ingredients are baking soda, epsom salts and citric acid. Essential oils and food coloring are optional. Some people add oils as well. There are instructions all over for how to make these, and it’s much cheaper than buying them at the store. Add the wet ingredients slowly to the dry ones, or you’ll start the fizzing reaction that belongs in your bath.